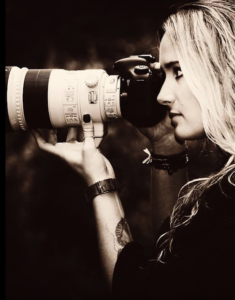 Penny Robartes has emerged as one of Africa’s great nature photographers. Her stunning creations breathe life into natural encounters with the deftness of an artist’s brushstrokes and the enthralling narrative of the best storytellers. Her photographs are intended to showcase the utter allurement of our natural heritage through moments captured, and the stories that they tell. Combining a conservation message with portraits of elusive and endangered animals becomes all the more poignant through the artistic interpretation she brings to every one of her works, with seemingly abstract compositions morphing graphically into poignant statements. Each image is a work of art but also a moment of Africa’s unbridled rawness captured forever. Penny has photographed and led multiple photo tours throughout Africa, predominately to South and East Africa. In 2016, she spent over 40-days living in the Masai Mara as a Photographer in Residence at Alex Walker’s Serian Kenya Camps and will be returning in 2017 to host multiple photo safaris. Additional to this, Penny will spend 2 weeks in Tanzania as Photographer in Residence at Alex Walker’s Serian Tanzania Camps. Her passionate and relaxed manner enables her to connect with and inspire each of her guests as she assists them in capturing and exploring their own unique vision. With her extensive travels to East Africa and her knowledge on its wildlife as well as photography, Penny is an undeniable force within the ORYX artillery.